Billionaire David Child swears he didn’t murder his girlfriend, Clara. But the evidence overwhelmingly shows that David killed her: the security video showed no one else entering their apartment, the murder weapon was in his car, and he was covered in gunshot residue he can’t explain. The FBI believes David’s arrest and obvious guilt could help them take down a huge money laundering scheme—if they can get him to testify. Con-artist-turned-lawyer Eddie Flynn is given the job: persuade David to plead guilty and give the agents the evidence they need. If Eddie can’t get David to take a plea bargain, the FBI has incriminating files on Eddie’s wife—and will send her to jail. But David insists that he didn’t murder anyone. Steve Cavanagh is an Irish author from Belfast and at the age eighteen he studied law by mistake. He is now the international award-winning author of the Eddie Flynn novels. 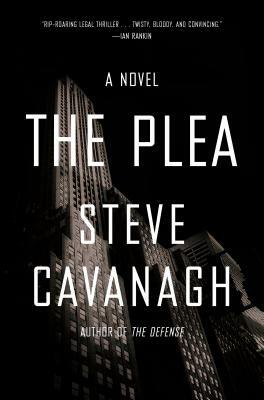 His debut novel, The Defense, was nominated for the Ian Fleming Steel Dagger Award for Thriller of the Year, and The Plea won the Prix Polar Award for Best International Novel. Steve is still a practicing lawyer (someday he’ll get the hang of it) and co-host ofthe chart-topping podcast Two Crime Writers And A Microphone. He has been involved in several high-profile civil rights cases, his Eddie Flynn novels have been published in over twenty countries, he’s married with two young children, and in his spare time he is mostly asleep. "Nasty, vicious, ruthless. That's the way we like our legal mysteries, so The Plea fits the bill…The impressive legal maneuvering pays off in a centerpiece courtroom drama."